Thus was the introduction to the Sfogliatelle recipe in Buddy Valastro’s Cake Boss cookbook so I absolutely had to try it. I would be meeting Buddy Valastro at his Cake Boss tour in Raleigh NC, 2011, and wanted to tell him that at least I tried. My son and I truly enjoyed the intensity of this recipe process. Buddy was right, it’s not for the faint of heart and you need a really BIG table. I covered our wood dining room table with a plastic tablecloth so we would have enough space. Holding the sfogliatelle dough after it went through the pasta machine. Starting Buddy Valastro’s “The Cake Boss” sfogliatelle dough. We put the sfogliatelle dough through the pasta rollers about a dozen times, sometimes folding it in half, until the texture seemed right. 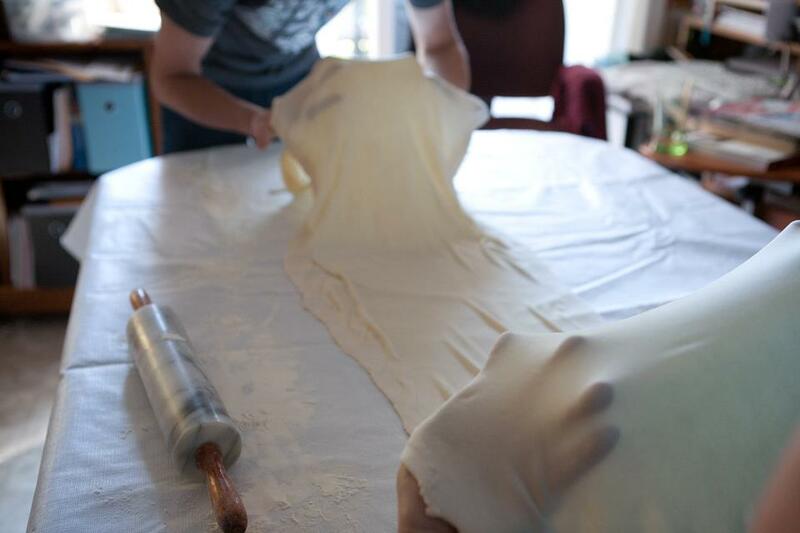 Beginning to stretch the long strip of sfogliatelle dough. 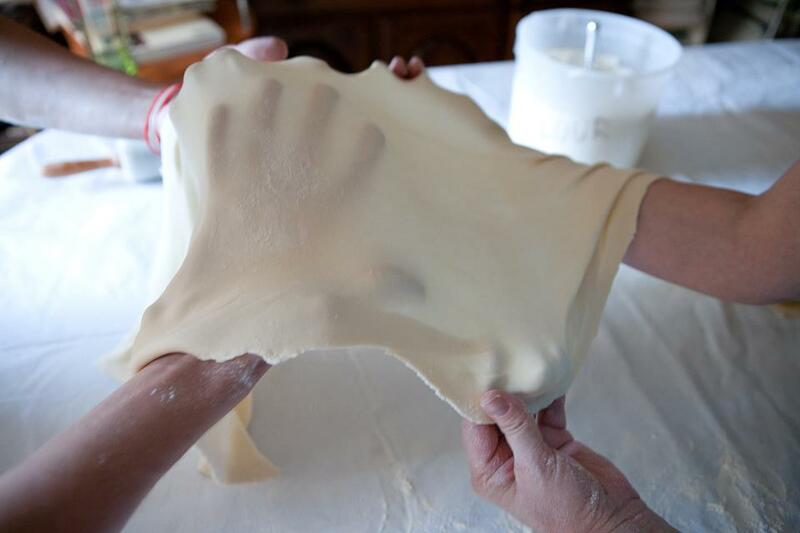 Here we begin to stretch the sfogliatelle dough. Continuing to stretch the sfogliatelle dough. 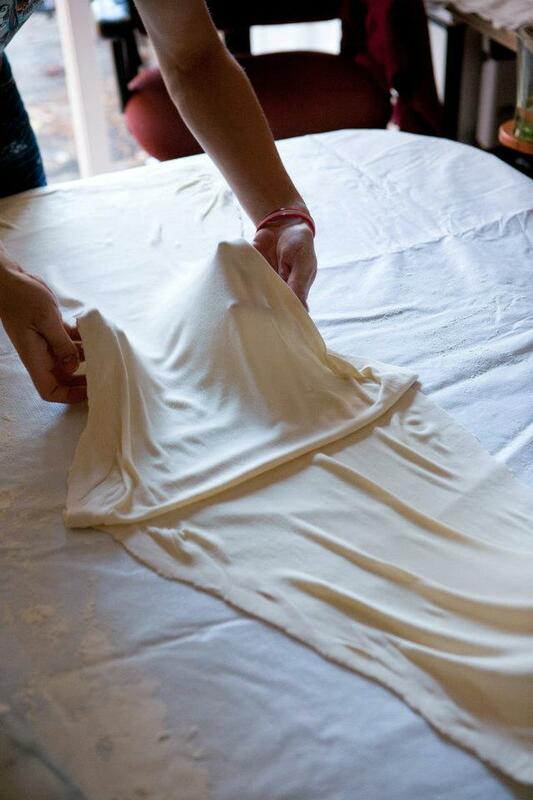 Stretching the sfogliatelle dough. The recipe is on page 175 of Buddy Valastro’s “Cake Boss” book. 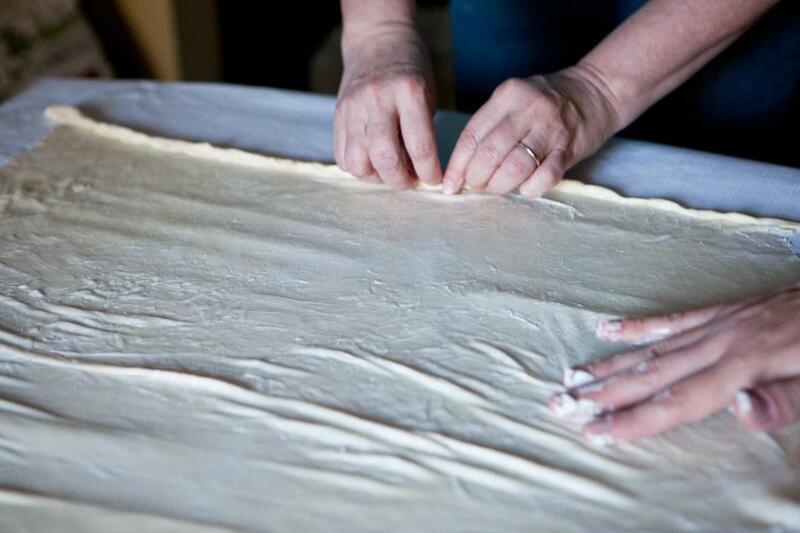 Stretching the thicker edges of the sfogliatelle dough. 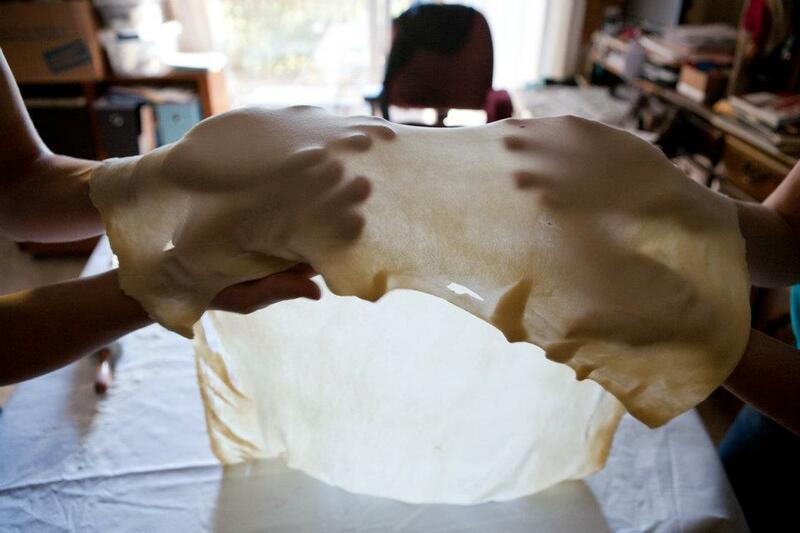 Stretching the edges of the sfogliatelle dough. The sfogliatelle dough felt incredible, like cool, soft velvet. It’s hard to believe this dough was made from just flour and water with a little sea salt. Amazing! It had a cold velvety texture and was super drapey and soft. Checking the thinness of the sfogliatelle dough. The dough is almost thin enough! 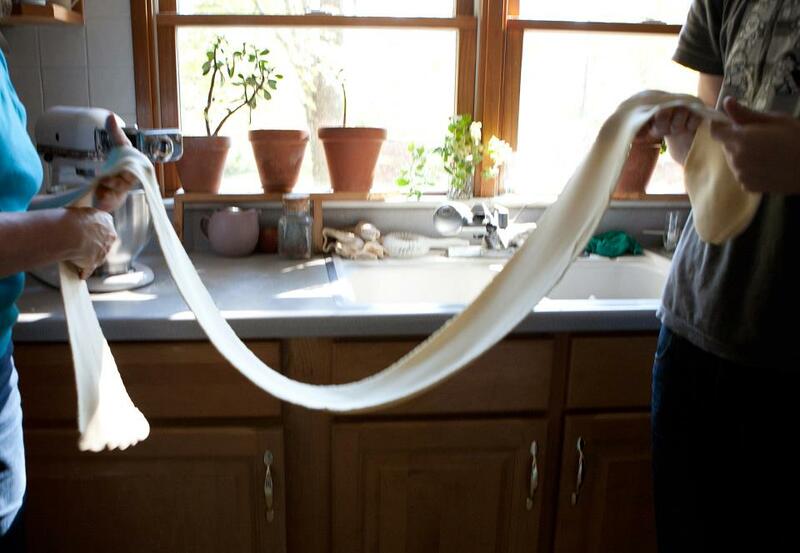 We had to take that little strip from the pasta machine and stretch it to 7′ by 2 feet. It hung over the ends of the table. Not too many holes in the dough. Yay! 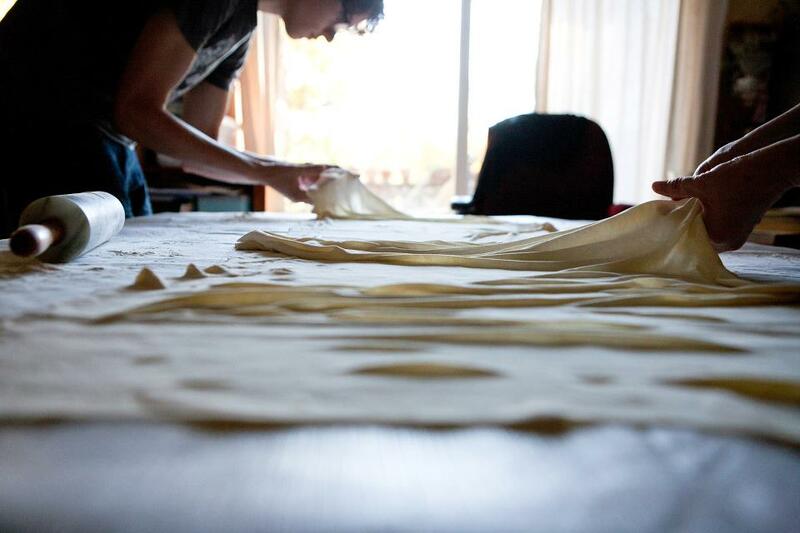 Sfogliatelle dough, stretched and thin enough with not too many holes. My son Noah and I are elated that we did it. 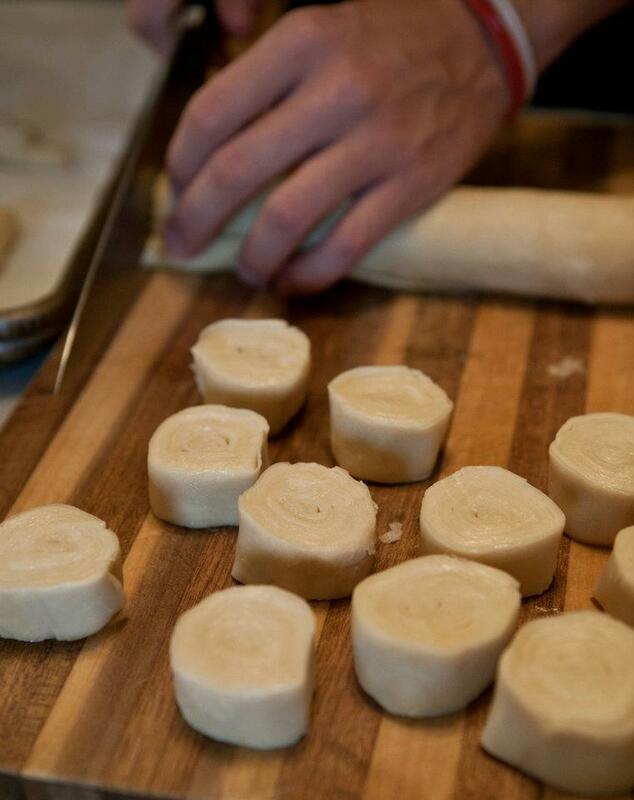 Spreading shortening by hand and rolling the dough. Beginning to roll the dough. Noah spreads shortening completely across the dough as I roll it. Continuing to roll the sfogliatelle dough. Continuing to roll the dough. We cut the two foot roll into two pieces and put them on a cookie sheet in the refrigerator to bake the next afternoon. 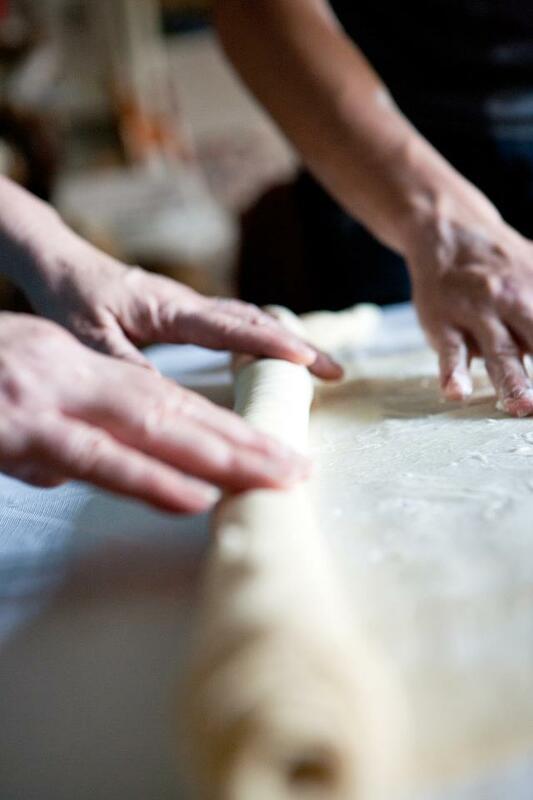 Slicing the long roll of sfogliatelle dough. 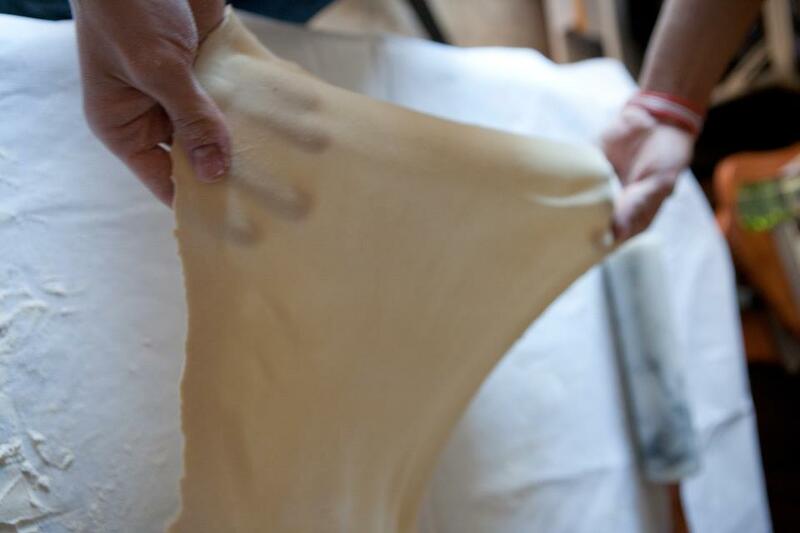 The roll of sfogliatelle dough is sliced 3/4″ thick for the beginning of Lobster Tails. Pressing the dough out like a telescope to make the cones for filling. Pressing the dough out like a telescope, the dough is formed into a cone. 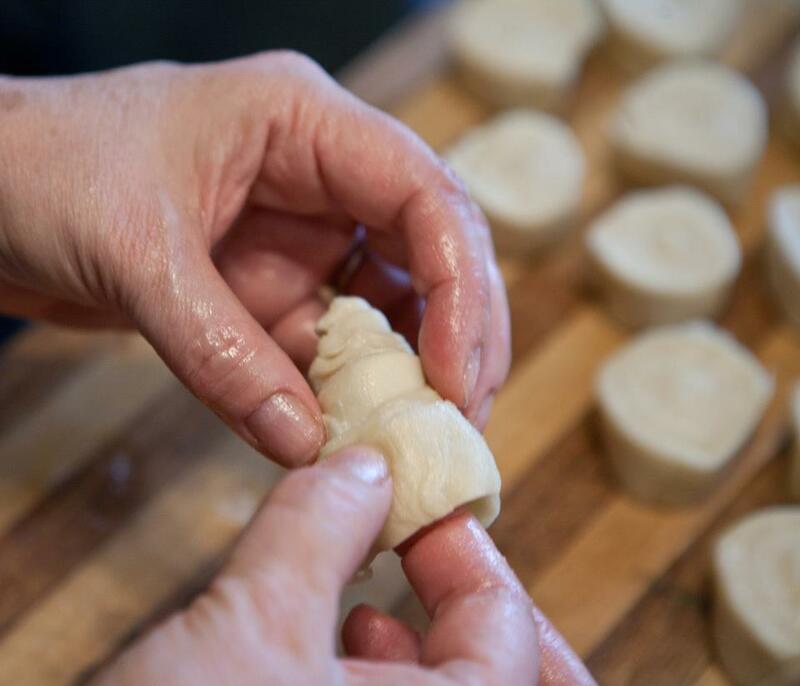 Piping the pate a choux pastry into each cone of sfogliatelle dough. Pate a Choux (Cream Puff dough) is piped into each cone of dough. It was quite a challenge piping filling into all the bent ones. They looked like mummy-strangled popovers, with filling oozing out all the cracks. The suspense is building, isn’t it? All that flaky goodness is surely going to be something amazing? Well… see the next photo. 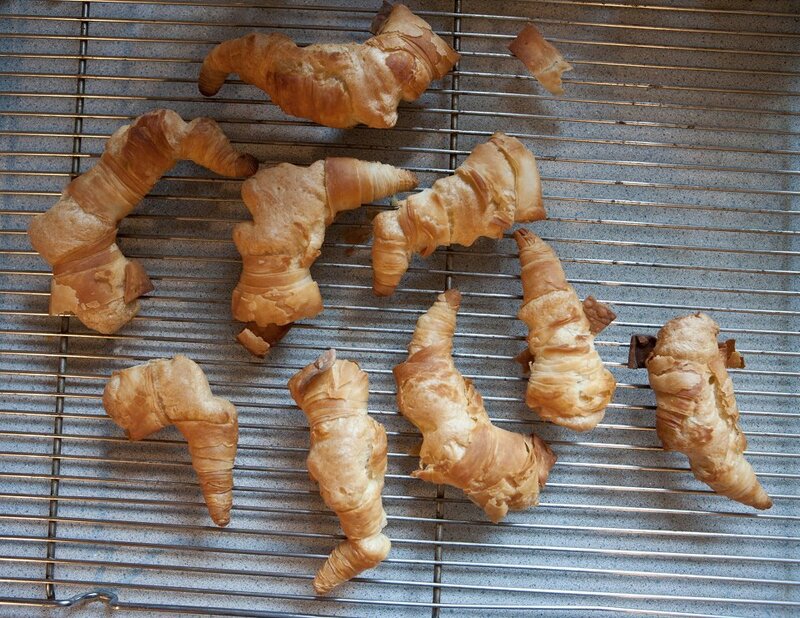 hahaha our super crispy and flakey sfogliatelle are all wonky! Ha ha ha ha! All our Lobster Tails burst! They look seriously deformed. We were ROFL over them. But they actually are extraordinarily light and crispy with a blizzard of shattering crumbs with each bite. 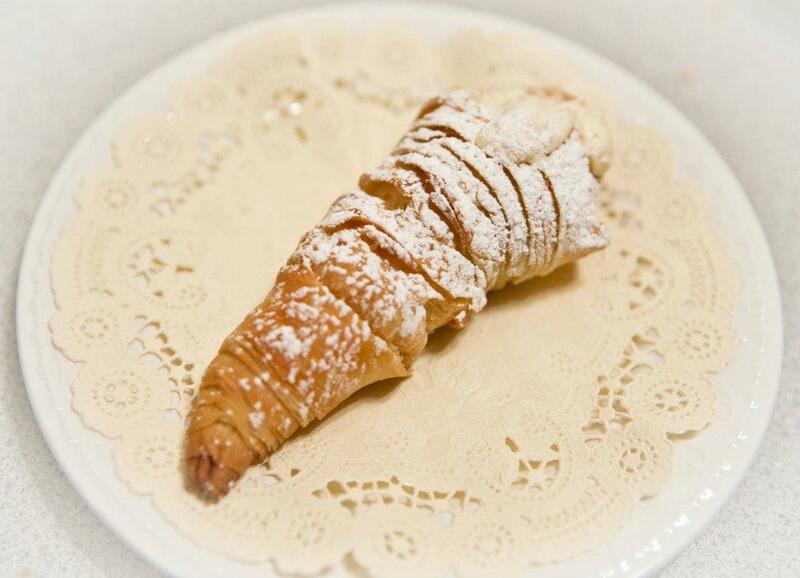 A sugar-dusted, crispy, light, amazing Sfogliatelle, recipe from The Cake Boss cookbook. Sugar-dusted Lobster Tail. Recipe from the Cake Boss cookbook. 3 days to make, 7 luxurious minutes to eat, 8 seconds to lick the fluffy, Italian Cream Custard Filling and last crispy crumb off the plate. I took a small container filled with the best of the sfogliatelle to Buddy Valastro’s show. He was so charming and entertaining and awesome! A genuine good-hearted soul. After his show, we stood in line for our chance to meet Buddy and get a picture taken with him. The line moved fairly quickly. As soon as it was our turn to meet Buddy, I opened my bin to show him my attempt at Sfogliatelle. The first thing he said was “Those smell good!” He picked one up and held it and studied it and said “It’s so light!” I was so happy! I asked him what we did wrong to make them all burst at the seams and he told me we rolled the dough too thin, to keep it thicker next time and to not push the cone out too much so there was more overlap of the strips. I got the impression that he would have loved to talk a lot longer about making good sfogliatelle but other guests were waiting in line for their photo with him. I would have loved to talk for hours about pastry! We got our picture and I walked out feeling so encouraged. It was a fantastic experience. 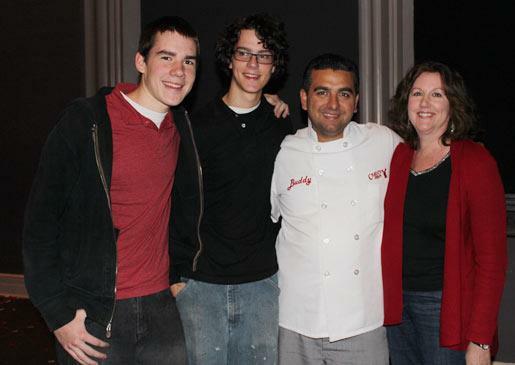 Meeting Buddy Valastro after his Cake Boss show in Raleigh NC 2011. For years I kept one sfogliatelle in the freezer because “That’s the sfogliatelle that was touched and blessed by Buddy Valastro!” haha That was the only time I’ve ever made sfogliatelle but I’m thinking of giving it another go. I raise a toast to the true Cake Boss.